When you enter the land the Lord your God is giving you and have taken possession of it and settled in it, and you say, “Let us set a king over us like all the nations around us,” be sure to appoint over you a king the Lord your God chooses. He must be from among your fellow Israelites. Do not place a foreigner over you, one who is not an Israelite. The king, moreover, must not acquire great numbers of horses for himself or make the people return to Egypt to get more of them, for the Lord has told you, “You are not to go back that way again.” He must not take many wives, or his heart will be led astray. He must not accumulate large amounts of silver and gold. When he takes the throne of his kingdom, he is to write for himself on a scroll a copy of this law, taken from that of the Levitical priests. It is to be with him, and he is to read it all the days of his life so that he may learn to revere the Lord his God and follow carefully all the words of this law and these decrees and not consider himself better than his fellow Israelites and turn from the law to the right or to the left. Then he and his descendants will reign a long time over his kingdom in Israel. Long before Saul was anointed as the first king of Israel the Lord God knew that the Israelites would one day desire a human king. Anticipating that day, God essentially identified three characteristics that the people should look for in a leader when that fateful day came. The first was that the king should not be excessively interested in material wealth -- he should not acquire large numbers of horses or wives or accumulate large amounts of gold and silver. God knew that accumulating these things would lead the king's heart astray. Second, God instructed that the king should keep a copy of the law close and read it every day. God knew that staying in the Word of God would be critical for the king to maintain reverence for the Lord. In fact, nothing has the power to keep a Christian leader focused on the right things, the right perspective and the right source than reading the Bible religiously. Finally, the Lord instructed that the king should not consider himself better than his fellow Israelites. God knew -- and knows -- that a Christian leader without humility and a sincere love of people is ultimately of little use -- regardless of how large his or her following may be. As I think about these instructions given all the way back in Deuteronomy, I wonder if we in the church tend to look for characteristics in Christian leaders that are more like those that God values or more like those that public companies look for in CEO's. It seems to me that there is a marked difference between the two. Are we looking for leaders who are appealing on the outside, who attract large numbers, and who seem to achieve tangible numerical results? Are we looking for leaders based on the number of followers they have on Twitter? Are we attracted to leaders who are well suited to be game show or talk show hosts or motivational speakers? Or are we looking for shepherds who constantly point toward Jesus and away from themselves? Are we looking for people who not just preach the Word, but try their best to imitate Jesus in the way they live? Are we looking for men and women who would give up their own lives rather than see one person in the flock that God has entrusted to them become lost? Time and time again we see God choose men to lead who outwardly do not fit the part. Moses, for example, had a speech impediment and was a murderer. He often became frustrated and impatient with the people. And yet, he would have given himself up for them. God's anger burned against the Israelites after the rebellion that lead to the golden calf. 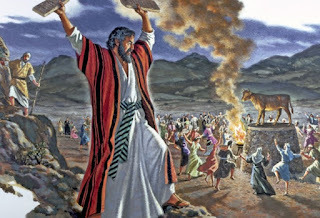 Moses burned with anger too. And yet he interceded on their behalf. Indeed, he stood with them no matter the consequence.